Please Note: If your PDF Printout has wide left margins that cause the document to clip the right side, please Click Here. A short review of Bluebird facts, including Family, Species, Behaviors, and other information valuable to the Bluebird lover. A short review of Bluebird Conservation, starting with the nationwide decline during the 1960s and following with how bluebird enthusiasts helped populations to rebound. A complete guide to bluebird habits, habitat, feeding, nesting, monitoring the nestbox, and other cavity-nesters (Published by Texas Parks and Wildlife). Information about bluebirds, their habits, and how you can help them to survive in the modern environment. This brochure was originally known as The Primer. General description of bluebird behavior during nesting cycle (often applies to other birds as well). Guide to identifying the nests, eggs and nestlings of birds that use nestboxes. Attracting insects and spiders to your garden may sound strange but Eastern Bluebirds primarily eat insects. This list will show you the plants that attract the insects and spiders that Eastern Bluebirds like to eat! Attract more Bluebirds to your garden by planting these Texas Native Plants to attract the right "bugs". Eastern Bluebirds are primarily insect eaters, but sometimes supplement their meals with berries. The plant list will show you the plants that provide nourishment for Eastern Bluebirds. Plant these Texas Native plants in your landscape and you will provide additional food for our Bluebird buddies. Answers to the most often asked questions about what a nestbox is, how to install it and and how to monitor it. Everything needed to get started with your new nestbox. Includes shopping list and instructions. Powerpoint presentation on the steps to installing a nestbox. Features to look for when buying your bluebird nestbox. If you want to build it, TBS has free plans that incorporate all of these recommended features. The design of our field-tested, Texas-Tough nestbox is available for free. This nestbox is sized for Eastern Bluebirds and other small cavity nesters. Page 2 includes a diagram of how to cut the pieces from a single 1x12x36 inch board. A table saw will speed up the cutting process, but all cuts can be made with a hand saw or circular saw. Adding a Heatshield to your nestbox is an easy and inexpensive way to protect your bluebirds from the intense Texas heat. Nestboxes are vulnerable to many predators, such as raccoons, cats, snakes, and fire ants. Adding the Kingston Stovepipe Predator Baffle will deter the clawed ones. If a House Sparrow has taken over your nestbox, you can humanely trap it with the Universal Sparrow Trap, also known as the Van Ert trap. If you have a TBS nestbox, the screws for attaching the sparrow trap are already positioned below the hole. Because the trap captures any bird that enters the nestbox, you must check your nestbox frequently (once an hour) after you've installed it. Think you know what makes a good bluebird nestbox? See if you can find 10 things wrong with this nestbox. Answers and explanations can be found here. 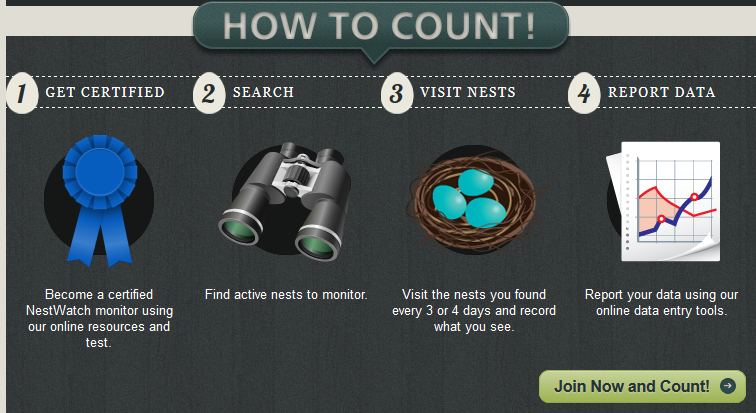 NestWatch is a nationwide monitoring program designed to track status and trends in the reproductive biology of birds, including when nesting occurs, number of eggs laid, how many eggs hatch, and how many hatchlings survive. Our database is intended to be used to study the current condition of breeding bird populations and how they may be changing over time as a result of climate change, habitat degradation and loss, expansion of urban areas, and the introduction of non-native plants and animals. Visit www.nestwatch.org for more information. Click here to download a nestcheck data sheet. "Color me" drawing by Elizabeth Morris for TBS. A great book for kids with lots of information about bluebirds and an activity section. Courtesy of Mountain Bluebird Trails, Inc.
From Birds and Bloom. Make a fun, inexpensive mealworm feeder for the bluebirds. Parental supervision may be necessary. 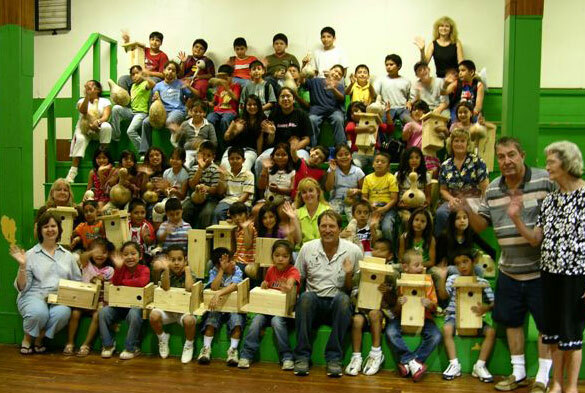 Visit http://www.sialis.org/children.htm for more bluebird activities for children. To find more information about bluebirds, visit the sites listed below. When you click on the link, the site will open in a new window. Learn how to make your backyard a wildlife paradise. For list of nurseries that sell native plants and seeds. For information on all aspects of native plants, grasses and trees and to find a chapter near you. Texas Bluebird Society is an affiliate of The North American Bluebird Society and encourages dual membership. NABS offers TBS members a $15 "A-Plus" membership (half-price). On membership form, notate "A-Plus". 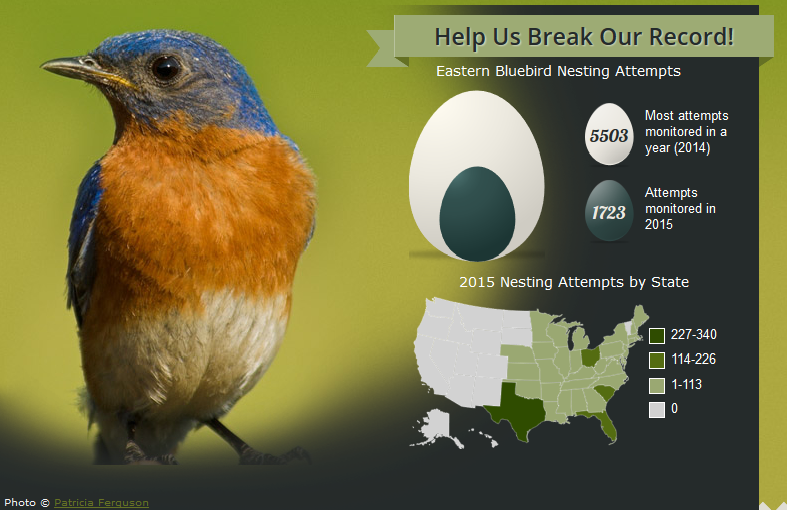 The North American Bluebird Society is a non-profit education, conservation and research organization that promotes the recovery of bluebirds and other native cavity-nesting bird species in North America. The website of Bet Zimmerman, the webmaster for "Best of Bluebird L". Rich of information and resources for bluebirders. Texas Wildscapes is a habitat restoration and conservation plan for rural and urban areas. It enables Texans to contribute to wildlife conservation by developing wildlife habitats where they live, work and play. Below are links to various nestcams set up in bluebird nestboxes. The House Sparrow is not a native bird to North America. Do not allow House Sparrows to nest. To protect your nestbox from sparrows, order a Van Ert House Universal Sparrow Trap. Other common predators include raccoons, snakes, free-roaming cats, fire ants, and hawks. To protect against these first three, NEVER mount a nestbox on a fence post or against a tree; this will allow predators easy access to the box. Instead, mount the nestbox to a pole and and a Kingston Stovepipe Predator Baffle. It makes difficult for predators (including snakes) to reach the nestbox. Download a plan and build it yourself. If you have cats, keep them indoors. Although predator baffles prevent cats from climbing poles and reaching into nestboxes, young bluebirds leaving the nest cannot fly well and may still fall prey to roaming cats. Studies have shown that feeding cats (to reduce their hunger) and tying bells around their necks (to warn birds of their approach) are ineffective, as cats will hunt when not hungry, and birds do not associate the sound of a bell with danger. The best way to protect birds and keep cats healthy is to keep them indoors. For more information visit the American Bird Conservancy's Cats Indoors page. For fire ants, wrap garden tape around the pole under the box or under the baffle, then apply the Tanglefoot Insect/Pest Barrier to the tape. Old nests attract fire ants, so be sure to remove them from the nestbox as soon as the birds have fledgled. Dispose of the old nest far away from the nestbox. If necessary, spot treat fire ant mounds. Unfortunately, little can be done to protect bluebirds against hawks. When choosing where to place your nestbox, avoid areas where hawks are known to nest, as well as powerlines/perching spots a hawk may use to search for prey.